Taiwanese flash memory non-volatile memory manufacturer Macronix is set to reveal technologies is says will make it possible for flash memory to survive 100 million read/write cycles. 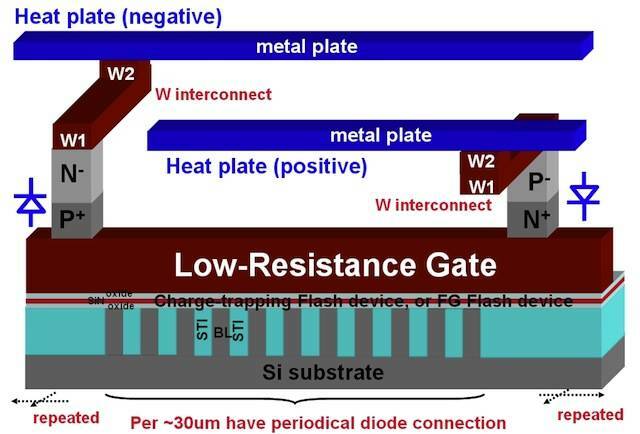 Today's flash memory wears out over time, because moving electrons in and out of transistors wears them down. That problem has led manufacturers to implement “wear levelling” algorithms that ensure data is not always written to the same regions of a disk. By sharing the work around, wear levelling helps flash disks to age gracefully, instead of frequently-used regions dying young. The likes of Intel and Samsung have, of late, been keen to point out that their wear levelling techniques are now so advanced that disks they make will likely survive all-but the most extended working lives. But Macronix's innovations, which it will reveal at the 2012 International Electron Devices Meeting in San Francisco on December 11th, look like making wear levelling irrelevant. Macronix's breakthrough is described as “A novel self-healing Flash, where a locally high temperature (>800°C), short time (ms) annealing is generated by a built-in heater.” This apparatus performs so well that the company says its tests reached 100 million read/write cycles without any signs of trouble ... and that longer life looks possible but they ran out of time to run more tests. A happy by-product of the process is faster erase times, giving flash yet another speed advantage over spinning rust.